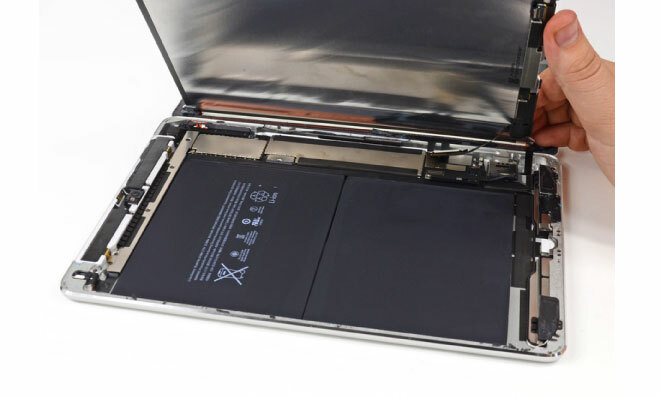 The inside of Apple's mobile devices is almost all battery. Photo via iFixit. When talks between Tesla CEO Elon Musk and Apple's mergers and acquisitions chief were first revealed on Sunday, immediate speculation centered around whether Apple, with some $160 billion in cash, would buy Tesla, which has a market cap of about $24 billion. Most, however, have dismissed that possibility, and are instead focused on potential partnerships between the two companies. One possible alignment could be for Apple to offer tighter integration of its iOS devices with Tesla's vehicles, or even to help design the user interface, which is already heavily reliant on touchscreens. However, that move would have limited reach for Apple, which sells tens of millions of devices every quarter, while Tesla for now remains a high-end brand with limited mass-market appeal. Thinking in the more immediate term, some market watchers have speculated that Apple could be interested in Tesla's proprietary battery technology, leading to smaller and more efficient mobile devices in the future. Batteries are of course essential to Apple's mobile devices, including the iPhone and iPad. A peek inside either device shows that the internal space is overwhelmingly taken up by a lithium-ion battery that allows hours of uptime. Batteries are an area of expertise for Tesla, the world's leading maker of all-electric cars. Tesla's vehicles are powered by the same lithium-ion battery technology that drives Apple's portable devices. 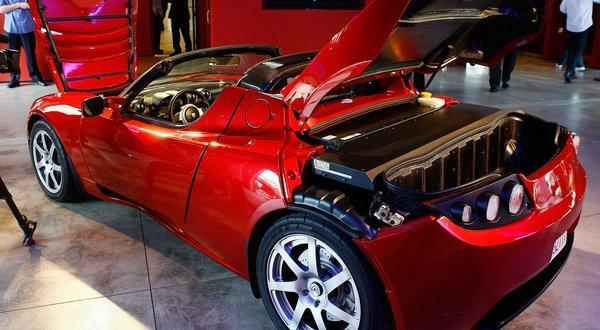 A Tesla Roadster battery pack, via Getty Images. The car manufacturer has made great advances in the manufacturing and efficiency of those batteries, with a full recharge on its vehicles now capable in just over an hour. Tesla is also working on battery swap stations that will give drivers a new, fully-charged battery in their vehicle in just 90 seconds. But Tesla still faces battery shortages for its vehicles —something the company plans to address by building its own factory and controlling the manufacturing process entirely. Musk, the company's CEO, has said that the new mega-factory would be comparable to all of the existing lithium-ion production in the world, all accomplished at one facility. Musk has promised that his company's new battery manufacturing center will be eco-friendly, reusing old battery packs and relying greatly on solar power. The CEO has also said the facility will "most likely" be in North America. As its devices become smaller and more powerful, Apple has shown considerable interest in new and advanced battery technologies. One report from earlier this month suggested that Apple is looking at solar and wireless inductive charging methods for its rumored wrist-worn "iWatch" accessory, a device the company is believed to be preparing for a potential late 2014 debut. There's also evidence from patent filings that Apple is interested in new curved battery designs that could fit into slimmer, more shapely portable devices. And one recent report suggested Apple has explored so-called "stepped" battery technology created by LG that could take different shapes and offer better longevity than existing options.